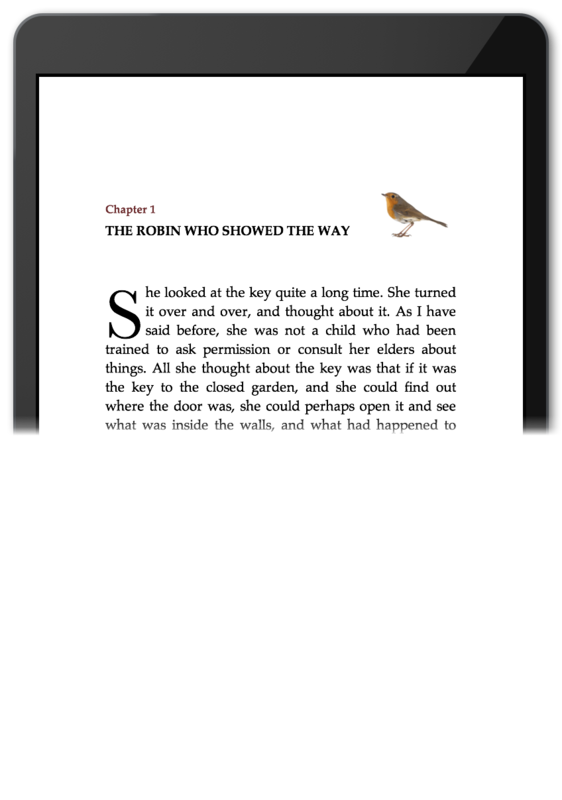 Vellum gives you control over many aspects of your chapter headings. The Title Editor allows you to edit your chapter’s title, as well as configure other options via its gear menu. To give your chapter a title – or to change an existing one – click on the large text at the top of the editor. You can specify the title in the provided text field. To restore your chapter’s title to its default value, use the Clear Title item found in the gear menu. You can clear the titles for multiple chapters by selecting them all in the Navigator and using the Chapter ▸ Clear Title item in Vellum’s main menu. The subtitle will appear in your chapter heading, but will not be listed in the Table of Contents. Volume elements have an additional menu item that allows you to add and remove the name of the author of the Volume. When you select the Add Author menu item, the author text field will appear. The author, like the title and subtitle above, will be affected by the Heading Style that you have chosen. For more information, read the Box Sets with Multiple Authors section of our Box Sets help page. Choose Add Heading Image… to decorate a chapter heading with an illustration, photograph, or other picture. Click the Heading Image to display its properties. The popover displays details about whether your image has enough resolution, and allows you to to enter a description for accessibility. Like the description for an Inline Image, this description is used by screen reading software to describe your image to a reader who might not be able to see it. A description is recommended unless your heading image is solely used for decoration. You can select additional elements in the Navigator by holding down the Command (⌘) key as you select. You can also select a group of elements by selecting the first, then holding down the Shift key as you select the last. Including Heading Images in your book will increase the size of generated files, which can affect your royalties when selling through Amazon. More information about file size, image size, and delivery costs can be found within File Size Considerations. 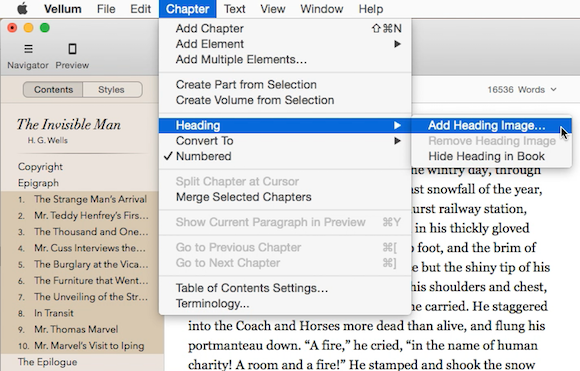 Use this option to control the visibility of the entire heading in your final book. 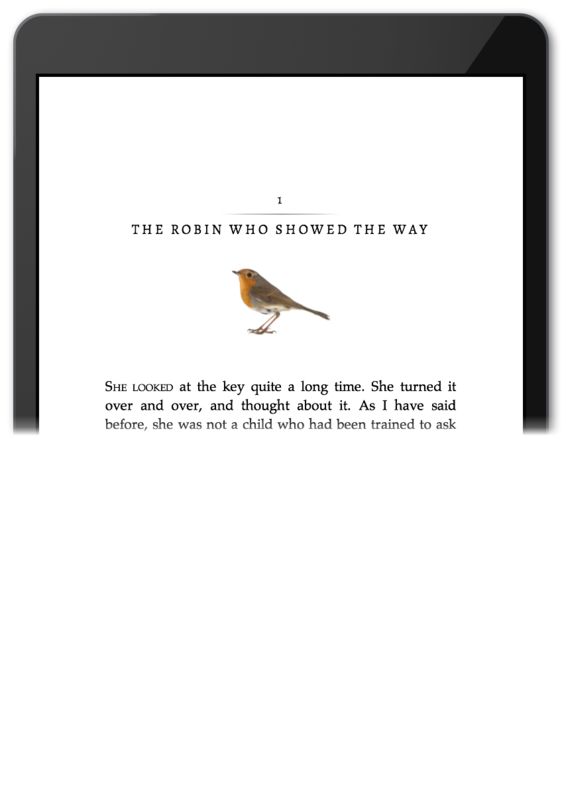 Elements like Copyright and Epigraph hide headings so that the title isn’t displayed. This option does not affect chapter numbering. Note: the title of your element will still be used in the Table of Contents, regardless of whether your heading is displayed. This indicates whether a Chapter should be numbered in the heading and in the Table of Contents. When unchecked, this chapter will not be considered when computing numbers for other chapters in the book. This option is not shown for other element types.